Thanks for the Germain group for your co-operarion and you made the programme successful. 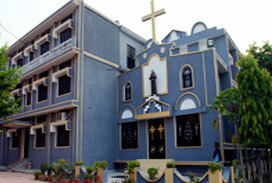 St. Francis Province Jalandhar is an offshoot of Alphonsa Province Pala of the Franciscan Clarist Congregation. Sisters from Pala province started missionary activities in the Syro Malabar diocese of Ujjain in 1970 and in the Latin diocese of Jalandhar in 1972 having been invited by the respective bishops, bishop John Perumattam and bishop SymphorianKeeprath. The first station in Ujjain was Shujalpur and the first in Jalandhar was Dhariwal. Understanding the need, the sisters started working in the field of education. Along with education, health ministry, pastoral work and social apostolate were taken up. Though missionary work was started in Ujjain first the religio-socio and cultural background in Jalandhar was more conducive to missionary work, and so more stations were opened in Jalandhar-at Gurdaspur in 1973, at Abohar in 1974 at Ajnala in 1975 at Nakodar in 1976 at Dinanagar in 1985 at Danewala in 1985 at Kartarpur in 1991, at Karyal in 1992 at Raekot in 1998, at Gaggal in Himachal Pradesh in 2000, in Delhi in 2002 and at Choggitti in 2006.